Fascinated by the supernatural? Not sure what the odd noise is at night? Visit Historic Cold Spring Village for Paranormal Weekend Saturday and Sunday, July 7th and 8th from 10am to 4:30pm. In addition to experiencing the Village’s 27 restored, historic buildings dating from 1691-1912, guests can enjoy various workshops, demonstrations and tours which highlight the study of spiritualism and the paranormal. Guests can also shop for good luck charms, talismans and jewelry. Have your fortunes told by card readers at an additional fee. During half hour Mini Ghost Walks lead by Bob Bitting guests may explore the Village’s own paranormal occurrences at 11:30am, 1:30pm and 3:30pm beginning at the Dennisville Inn. New this season Precision Paranormal and EVP Paranormal teams will be here to share their findings of prior Village investigatios. Long time investigators of the unknown in South Jersey look to debunk paranormal claims using EVP, video, Kinnex and other instrumentation to measure the presenece of the unexplained. Hear and see what they experienced while in the Village. Meet Kelly Roncace author of “Haunted Gloucester, Cumberland and Salem Counties”. She will share her experiences in paranormal investigation and maybe give a sneak preview into her new book featuring Cape May County and happenings at the Village. Meet Doug Hogate, Jr. cohost of internet’s Wild Fire Radio of Philadelphia and Founder of Jersey Unique Minds Paranormal Society. He will share his experience at the Village. Gordon Ward will lecture on Historic Haunts in New Jersey. Gordon hails from North Jersey and has been involved in strange occurances throughout the state. He is an author, podcase host, presenter and musician. Returning to the Village is Greg Geraci with haunting spirit photography of local sites. Young and old may enjoy children’s crafts, story time and our new Superstition Scavenger Hunt! Additional programs include hands-on demonstrations of divining rods, lectures on Spiritualism and Phrenology of the 19th century, please see hcsv.org for schedule. In addition to “Paranormal Pursuits” weekend, Thursdays in June, July, and Thursdays and Saturdays in August Ghost Walks are held at 8 pm starting from the Cold Spring Brewery. Tickets for adults - $15, discount tickets for Members, children 13 years and under - $12. Advance tickets are available through hcsv.org. In addition to “Paranormal Pursuits” weekend, Thursdays in August Ghost Walks are held at 8 pm starting from the Cold Spring Brewery. Tickets for adults - $15, discounted tickets for HCSV members, children 13 years and under - $12. Precision Paranormal will be here! A fun filled weekend of 1800's games and frivolity will take place at the first Village Field Day, August 18th-19th! Bocce Ball, Sack Races, and much, more. Games for young and old alike! Take an over 45 minute walking tour that highlights the paranormal "visitors" and activities that have been experienced by the Village staff over the years. The evening starts with a delicious casual fare in a private dining room at the Cold Spring Grange Restaurant. The entertainment for the evening is Craig McManus and the spirits he channels. Craig has been working as a medium since the 1990s, channeling for clients around the world. His lifelong fascination with ghosts has also lead him to a career as a prolific author about ghosts and haunting. After the meal, Craig will tell you when he senses a loved one. He will relay information from that person and act as an intermediary in the conversation between you and your loved ones. Craig does not control who comes through in a session. Due to time constraints not everyone will receive a reading. PLEASE click on the red BOOK NOW button to purchase your tickets! 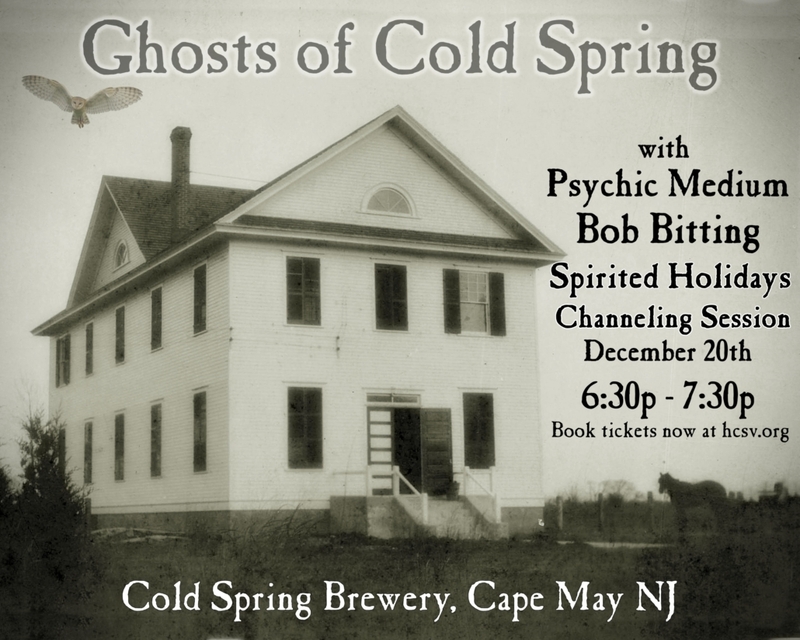 Join us at Cold Spring Brewery as we gather 'round the fireplace with local physic medium Bob Bitting as he discusses the history of Cold Spring like you've never heard it before! 11/8/18- "Haunts of Dennisville Inn"- Bob talks about Jeremiah Johnson the areas first postmaster, Thomas Henderson, and Jacob & Hannah Wells. 11/15/18- "Coxe Hall Carnage"- Bob speaks about a Revolutionary War soldier, the mumbling woman and the 3 murders of James Bud, Thomas Bancroft, and Johnathan Hoffman. 11/29/18- "Peculiar Pathways" - Bob discusses the Lenape tribe, Emma Douglas and the small children who have never left the Ewing Douglas house (Ice Cream Parlor). 12/6/18 - "Shadows & Specters" - Bob covers Corson-Hand house, Bookbinding shop, the octagon house (coop), shadow people and the buildings at Historic Cold Spring Village that attract or repel spirit energy. 12/13/18- "Spicer-Leaming & the Witches of Cape May" - Bob will discuss Sam Spicer, Hannah Leaming, Elizabeth Garlick, and the spirits of children that still reside in The Print Shop. 12/20/18- "Spirited Holidays" - A special channeling session. Please attend with high positive energy! Tickets are $20.00 and are available for purchase. Just click the "Book Now" button! December 20, 2018 at 6:30pm at Cold Spring Brewery. Spiritualist Medium & Psychic Bob Bitting will offer a special channeling experience. Reserve tickets are $20.00 and are available now on hcsv.org. Click the “Book Now” button. Proceeds benefit HCSV Foundation a non-profit living history museum. Please stay tuned to Facebook for topics and information. Mermaid Mutineer will be anchored outside Cold Spring Brewery selling their delicious comestibles!